Manchester United have reportedly received some good injury news as Romelu Lukaku is now expected to make it back for the Premier League game against Watford. The Red Devils take on the Hornets in their first game back after the international break on March 30, and had been sweating over Lukaku’s fitness. However, the Daily Mirror claim the Belgium international should now be back in time for that game despite suffering a foot injury that has kept him out of his country’s upcoming games. 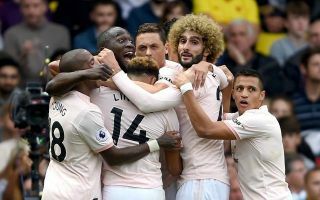 Although not always a regular starter under Ole Gunnar Solskjaer, Lukaku has shown his worth to United in recent games and they’ll want to have him involved again as soon as possible. The 25-year-old has long been one of Europe’s most clinical finishers, and showed that on the biggest stage as well recently with a brace in the club’s historic away win to knock Paris Saint-Germain out of the Champions League. United will take on Barcelona in the quarter-finals of the competition and will need everyone fit and firing ahead of that huge tie.